How are you celebrating American agriculture in your life? 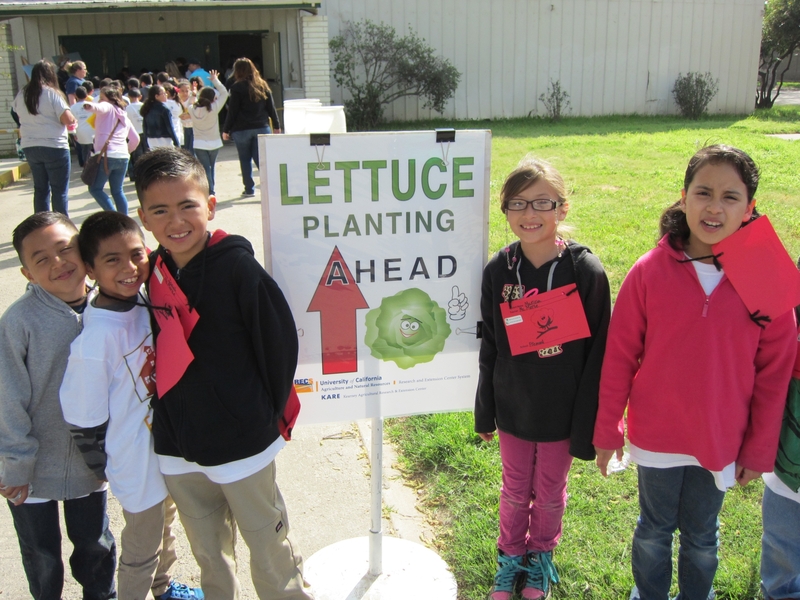 In advance of National Ag Week, March 19-25, and National Ag Day, March 21, Central Valley third-grade students were “learning with lettuce” how to bring more agriculture into their lives last week. The UC Kearney Agricultural Research and Extension Center offers the free lettuce plantings every year at Farm and Nutrition Day in Fresno County and Kings County, typically around the time of National Ag Week. National Ag Week and National Ag Day celebrate American food, fiber and fuel producers and their important contributions to our lives. Volunteers enjoyed working with each student to get their seedling off to a great beginning. 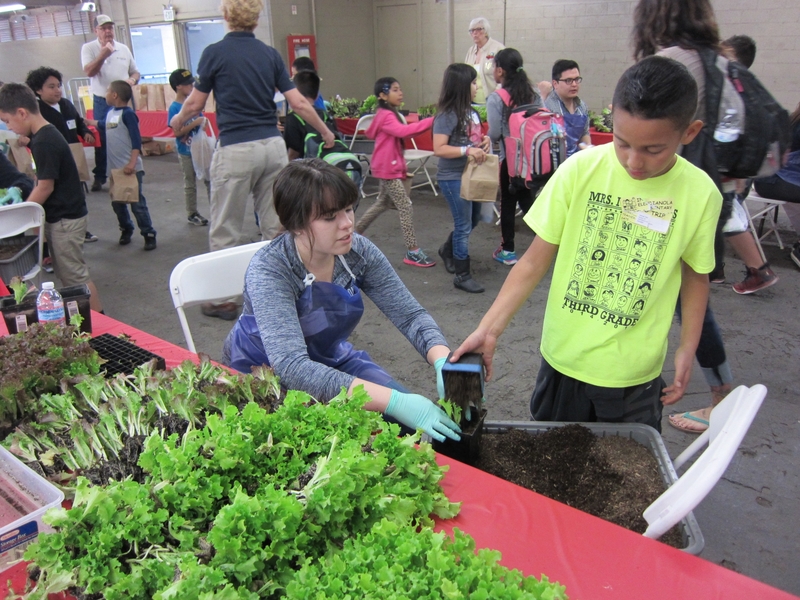 Students with the help of volunteers learned how to plant tiny lettuce seedlings into a pot of healthy soil to take home for transplanting later. 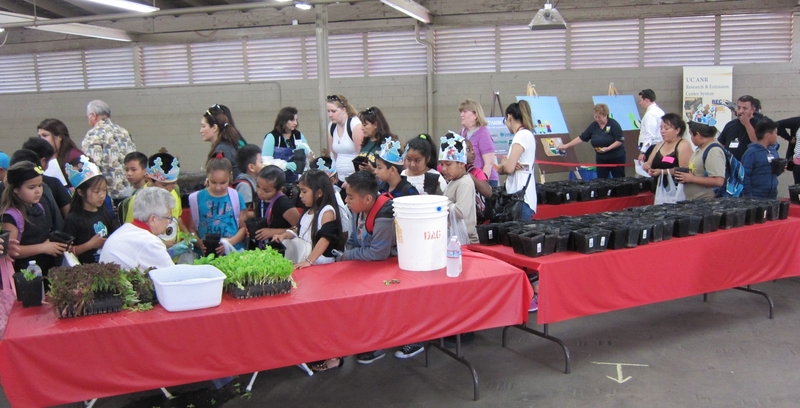 In addition to helping the students connect their food to agriculture, the lettuce planting offered an engaging, hands-on experience growing healthy and nutritious food at home. 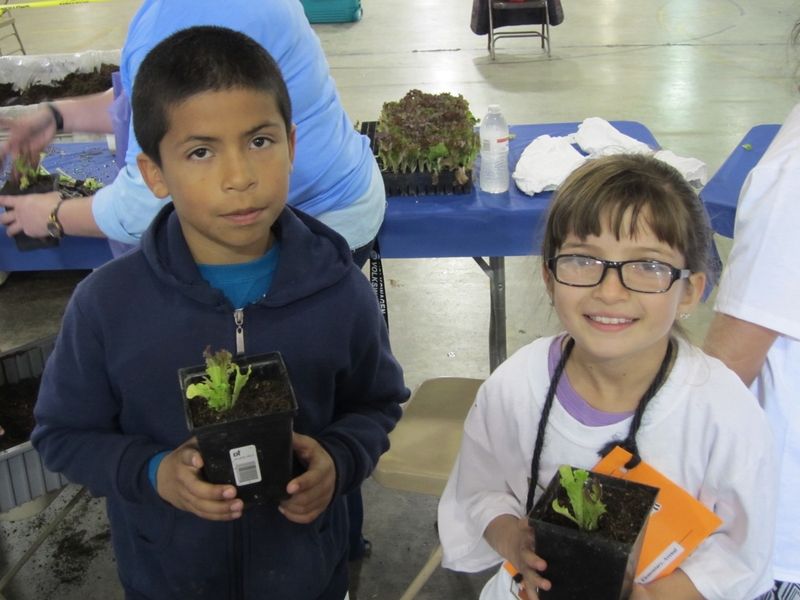 Third grade students from Fremont Elementary School joined classmates on their way to Kearney's lettuce planting at last year's Farm and Nutrition Day. 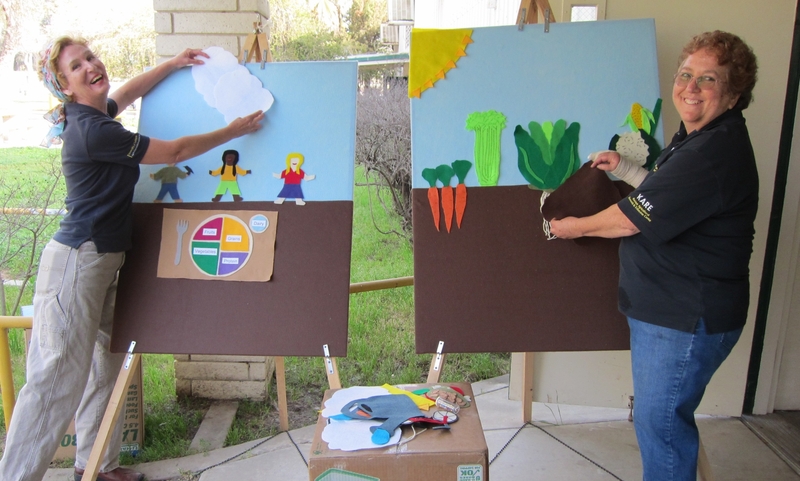 Julie Sievert and Laura Van Der Staay prepared a lesson that teaches students about the parts of a plant and what a plant needs to grow our food, fiber and fuel crops. • Understand how food and fiber products are produced. • Appreciate the role agriculture plays in providing safe, abundant and affordable products. • Value the essential role of agriculture in maintaining a strong economy. • Acknowledge and consider career opportunities in the agriculture, food and fiber industry. 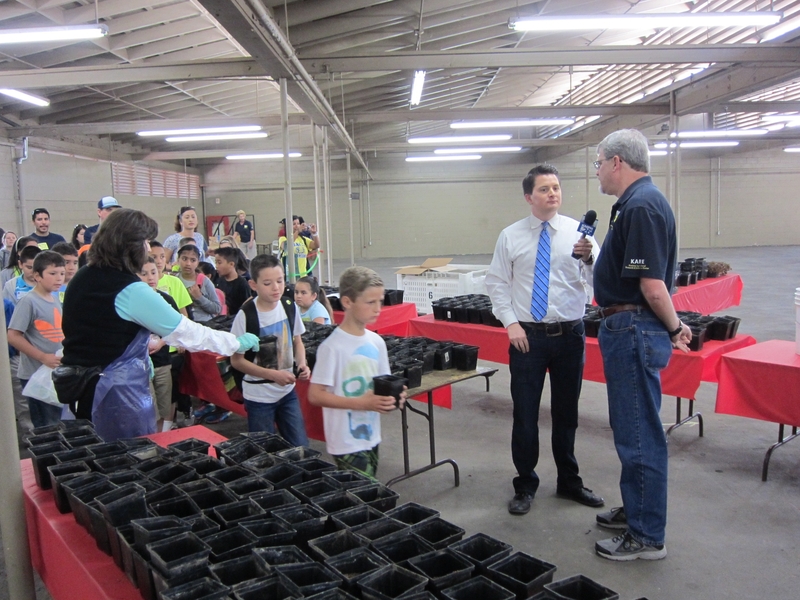 Kearney director Jeff Dahlberg was interviewed about Kearney's education and outreach programs. Each American farmer feeds about 144 people. As the world population soars, there is even greater demand for the food, fiber and renewable resources produced in the United States. Agriculture is this nation's #1 export and incredibly important in sustaining a healthy economy. That's why National Ag Week is a great time to reflect on and be grateful for American agriculture. With lettuce seedlings in hand, happy junior gardeners were ready to continue the learning experience at home. Central Valley students eagerly lined up to get started on their lettuce planting fun. 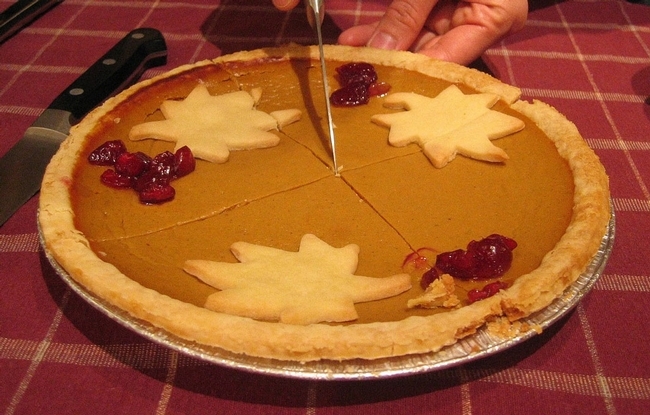 Holidays fan the flames of our love affair with food. As soon as summer melts into fall, our thoughts leap ahead with mouth-watering anticipation to family gatherings around a Thanksgiving or Christmas feast with all the trimmings. Months before the turkey is carved, you can almost smell it roasting in the oven. You can almost taste the salty goodness of stuffing and gravy. You can almost see colorful visions of home-baked treats dancing in your head. Your sense of taste, smell, sight, hearing and touch sends signals to your brain that the holiday feasting season has arrived. These basic senses are the tools that influence how much you like – or dislike – the foods you eat. Sensory evaluation also has practical applications in agriculture. UC Agriculture and Natural Resources researchers and their colleagues often conduct sensory panels for specific food crop studies. Recently volunteer evaluators filed into the sensory evaluation lab at the UC Kearney Agricultural Research and Extension Center to participate in a grape sensory panel. UC researcher Mary Lu Arpaia and USDA researcher David Obenland collected data for a study on the impacts of various storage conditions on grape varieties. 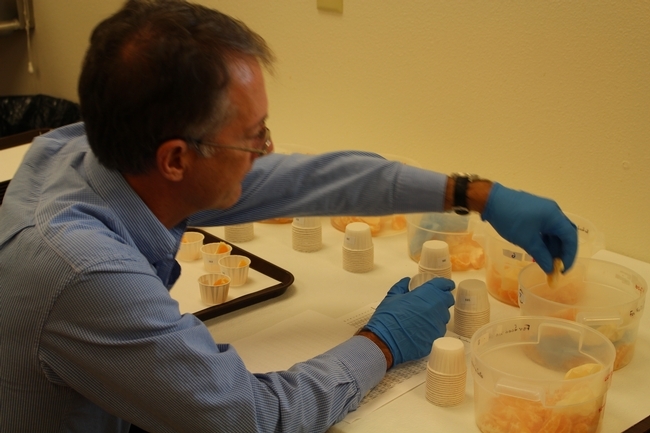 David Obenland of the USDA prepares citrus samples for evaluation. 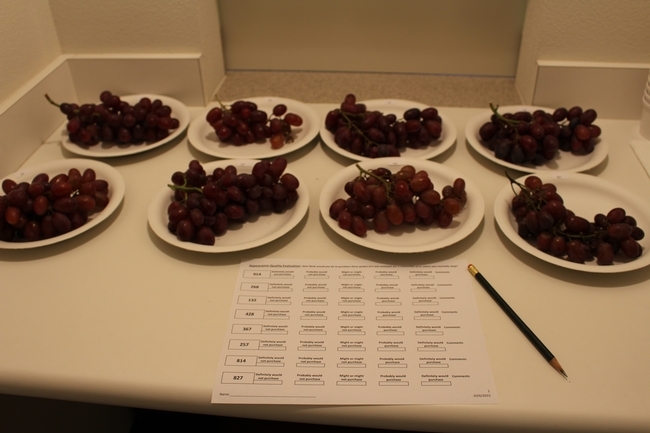 Evaluators tasted grape samples and recorded their responses to appearance, taste and texture. Samples given to each evaluator were randomly ordered to eliminate bias in the test results. Evaluators were instructed to sip water between tastings to cleanse the palate.  Evaluation procedures can vary slightly from product to product. When sensory panels are conducted for avocados, evaluators are instructed to munch on raw carrots before sipping water due to the oil in avocados. The coarse texture of carrots more fully cleanses the palate between avocado tastings. Other sensory panels have been conducted on citrus. “There's a bit of psychology involved as well. How the product looks can influence your perception of how it tastes. To further eliminate bias, evaluators are intentionally isolated in individual stations so as not to be influenced by their neighbors' reactions,” explained David Obenland. Grapes are displayed for evaluators to rate fruit appearance. The sensory evaluation lab at the Kearney Agricultural REC reflects the current philosophy of fruit commodity research that the industry's focus should be on sensory evaluation, from new pest management to horticultural practices to varietal improvements. The lab was completed and dedicated in April 2008 with support from the California Avocado Inspection Committee, Citrus Research Board, Food Machinery Corporation, Peach, Plum and Nectarine Growers of California, Sunkist and Table Grape Commission. We are what we eat. Unfortunately, we don't always make the best food choices. Sometimes it's simply a lack of will power. In communities struggling with high poverty rates, it's often the result of low incomes and limited food options. Dangerously high obesity rates, especially among youth, are a major public health concern in the United States. The health of California youth reflects this disturbing national trend. 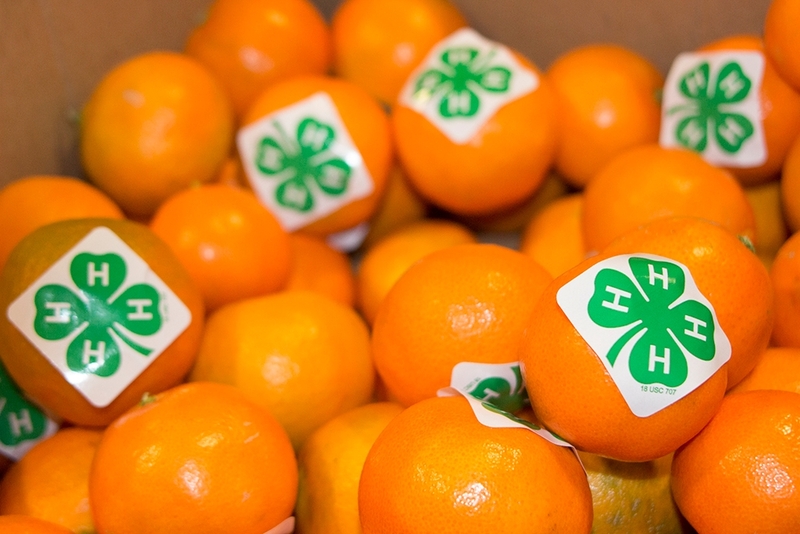 To address the challenge of childhood obesity statewide, the California 4-H Food Smart Families program will be implemented at four sites in Fresno, Orange, Sutter-Yuba and Tulare counties this year. Additional UC partners will include the Expanded Food and Nutrition Education Program (EFNEP) and CalFresh. Youth need to increase consumption of dark green veggies and whole grains, and decrease intake of sugar and saturated fats. 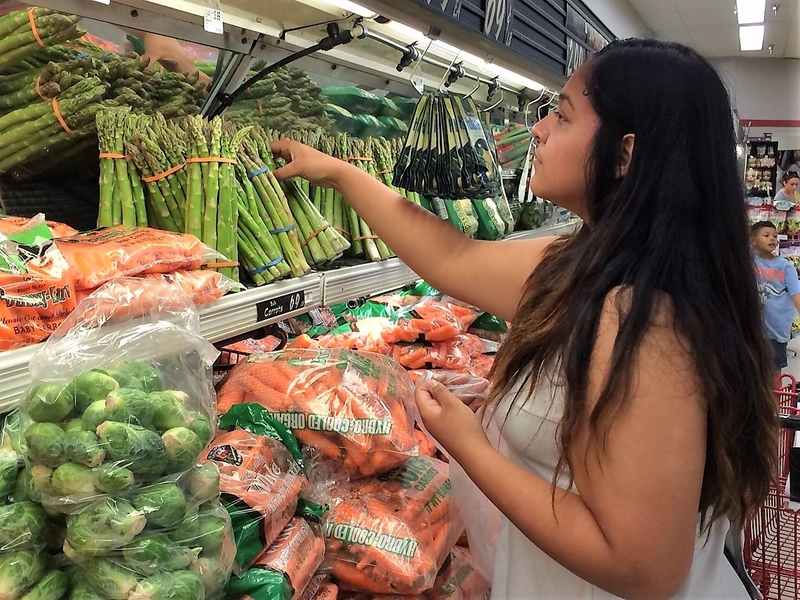 The objective of California 4-H Food Smart Families is to increase knowledge and create behavior change related to nutrition, cooking, gardening, physical activity and food preparation. 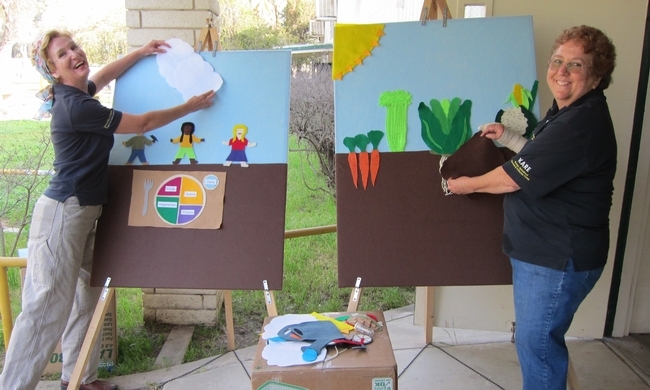 The program engages youth 8 to 12 years old and teens in 4-H Healthy Living programming. Youth will be directly reached through lessons delivered at after-school sites, low-resource elementary schools and organized field days at four UC Agriculture and Natural Resources Research and Extension Centers (REC): Kearney REC in Parlier, South Coast REC in Irvine, Sierra Foothill REC in Browns Valley and Lindcove REC in Exeter. The program is structured around positive youth development curricula and practices which provide an intensive engagement of underserved children, teens, families and other stakeholders. Local 4-H teens will be recruited and trained to deliver programs and assume leadership roles. 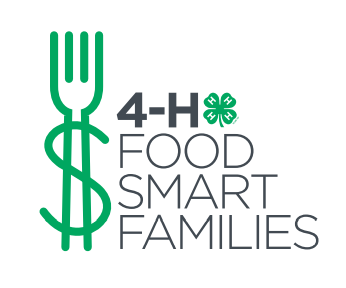 The National 4-H Council partnered with the ConAgra Food Foundation to launch the national 4-H Food Smart Families program in 2014. 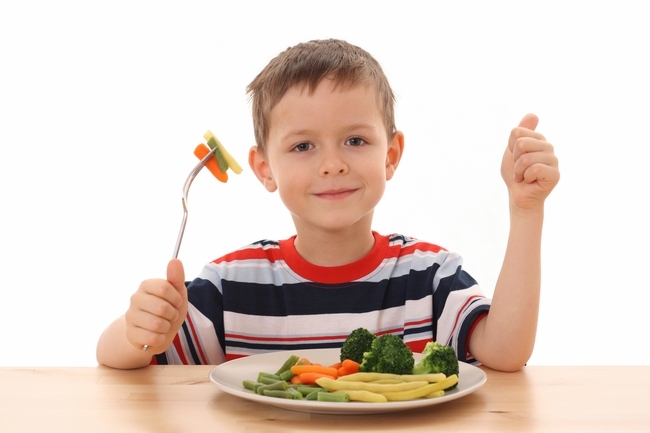 ConAgra sponsored funding to award grants to five states for program implementation. This year, in addition to the original five states, California and Louisiana were awarded grants as new participants. Inclusion of the UC Research and Extension Centers in the California program is a new model that organizers hope will be replicated elsewhere. Youth and families who visit the centers will witness first-hand not only how food is grown, but also the science behind it. Center specific lessons may be added to highlight the unique nature of local agriculture and natural resources and the food crops cultivated and studied at each center. Programming at California sites will get underway this fall and will continue through the school year. Look for more exciting California 4-H Food Smart Families news in the coming months as programming and activities kick into high gear.